by 1976,i was enjoying the pubrock & punk explosion,but was still playing in folk clubs myself,much to the disdain of the trad folkies.I eventually formed "shoot the lights out",we where featured in smash hits in 77 via a magazine article teesside smells. by 79 i had formed the cambodian generals then the apes of god,& unfortunately a lot of it was on cassette & where left behind to god knows what when i moved house some years later. the year 2000 saw me involved with a project called "a full head of steam", an album celebrating 175 years of railway history, i wrote a song for this album along with ,lindisfarne,vin garbutt,martin stephenson(the dainties),& jez lowe.175 years via the stockton & darlington railway. 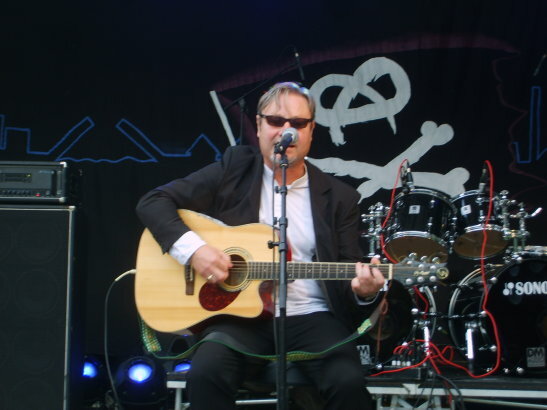 2007 saw my 1st record deal following tours of ireland scotland & wales & festivals throughout england.Spook records(now lighthouse) recorded & mixed my 2nd album "the passionate pilgrim", it followed "man on the wire" & of course "a full head of steam". In recent years i have toured scandinavia & have gained a following there. In august you will find me gigging in austria.,now working on a new album. OH! almost forgot to mention,september 2012 i hitch hiked & busked to orkney & back to hartlepool(500 miles round trip) to raise funds for alzheimers awareness,a disease that claime my dear mothers life that same summer, because of the severe weather i raised 570 quid.